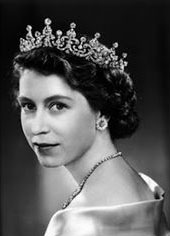 In honor of Queen Elizabeth’s 90th birthday today, we would like to share a bit of her amazing life. Pulled from the vaults of a True Romance Magazine in June 1953, we proudly present the first of 2 parts detailing the life and love of this wonderful woman. On June 2, a slim, sweet-faced young woman of twenty-seven will stand in the misty nave of Westminster Abbey and how her brown head to receive the ancient crown of England. Thanks to the modern magic of television and radio, the eyes and ears of the whole Western world will be upon Elizabeth the Second at that moment. To us in America, as we listen and watch, will come some of the same magic that touches the people of Great Britain in that solemn, hopeful hour. When, the ceremony over, the cameras swing from Elizabeth, we will see another figure—tall, handsome Philip, Duke of Edinburgh, husband of the Queen. For an instant, perhaps, his eyes and hers will meet, just as the eyes of a husband and wife seek each other out the world over to flash a message of shared understanding. And suddenly these two people will not be the queen of a great nation, and her consort, but simply a man and woman building a life together, under conditions which are more difficult, in a special kind of way, than any other young couple in the world are asked to face. For a queen must be more than a woman, more than a wife, more than a mother. And the husband of a queen must have in abundance qualities few men possess—tact, and generosity, and a willingness to stay in the background. He must always take second place to his wife. Whether or not it is decided to give Philip the title of Prince Consort, he has the distinction of being the first husband of reigning Queen of England to be loved and admired by the public. And this fact is in itself a tribute not only to him, but to Elizabeth—and above all to the love they have for each other. Many a royal marriage has been arranged for reasons of state. But Elizabeth and Philip’s was a love match, a romance to catch the hearts of lovers everywhere. It will be six years next November since the wedding of Queen Elizabeth and the Duke of Edinburgh. On November 20, 1947, she was Princess Elizabeth and he had until recently been plain Lt. Philip Mountbatten of the Royal Navy. But they both knew, even then, that this moment of Elizabeth’s coronation must come eventually. That knowledge had been one of the most stubborn obstacles to their marriage. 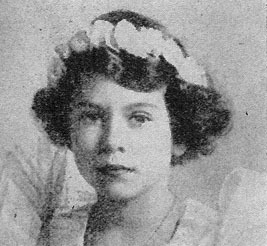 From the moment of her birth on April 21, 1926, there was always the possibility that Elizabeth might someday be Queen of England. It was no more than a possibility at first, because her father, the Duke of York, was only the second son of King George V. The eldest son, the Prince of Wales, was a bachelor and likely to be married at any time and so produce an heir. Elizabeth was third in succession. But when Elizabeth was ten, the whole situation changed. George V, her grandfather, died, and shortly afterward his eldest son, King Edward the VIII, renounced the throne in order to marry the American divorcee, Wallis Warfield Simpson. 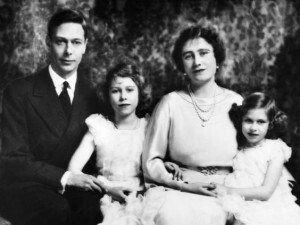 Elizabeth’s father became King George VI—and Elizabeth stood next in the line of succession to the throne of England. From then on, Elizabeth was trained to be Queen. She did her lessons standing up —because a queen must spend long hours on her feet at reviews and receptions. She learned the royal traditions of England, and how it is that a queen can never be quite a private person, but must belong first of all to the people of England. 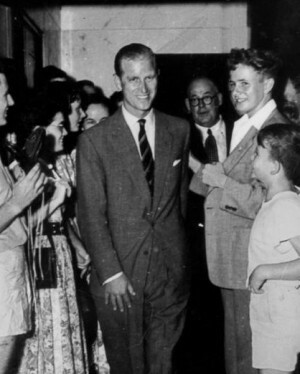 At occasional children’s parties, she met the boy who was known as Prince Philip of Greece, a tall, towheaded lad nearly five years her senior. 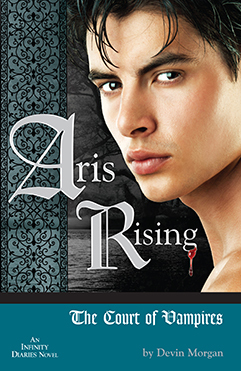 She thought he was inclined to be superior and rowdy, and didn’t like him much. But then, she was only six and he was eleven. Philip and Elizabeth are actually distant cousins, descended from the same great-great-grandparents—Queen Victoria and her husband, Prince Albert. But while Elizabeth is directly descended from Victoria’s oldest son, Edward VII, King of England, Philip’s line began with Princess Alice, a younger daughter of Victoria, who was never in line for the throne. Though he is of Royal blood, Philip has never been in the direct line of succession to any throne. Through the complicated intermarriage of royalty in Europe, he can claim the titles of Prince of Greece and Denmark, but essentially Philip is English through and through. He was sent as a young boy to England and raised there under the care of his uncle, Lord Louis Mountbatten. By training and inclination he became completely British, but the mere fact that he inherited the title of a Greek prince created a good deal of confusion in the minds of the British people when it first became apparent that Elizabeth and he were in love. Growing up, Philip and Elizabeth saw each other from time to time. Elizabeth and her sister Margaret Rose were friends with Pamela and Patricia Mountbatten, Philip’s cousins, and often visited them. If Philip was there, on vacation from his boarding school, he joined their games. Once Elizabeth coaxed him into taking a part in one of the Christmas plays she loved to arrange, but he was so plainly uncomfortable and self-conscious in his role, that she relented during rehearsals and let someone else play the part. Even then, as a boy, Philip loved the sea. His school had been specially selected to prepare him for the Royal Navy, and on practice sailing trips he was always chosen to work in the galley because he was the one boy who could be depended on not to be seasick. He was then, as he is now, a gay, easy-going fellow, with a keen sense of fun, and highly independent. He was annoyed by the tradition, of what he called “this royalty nonsense, and he always liked the society of ordinary, everyday people. By the time the war began, Philip and Elizabeth were good friends, in an easy, uncomplicated way. Philip, at eighteen, went straight into the Navy as a midshipman, serving in the Mediterranean Fleet. Elizabeth stayed in London, with her parents, waiting for the bombs to fall. As the war years passed, Elizabeth turned from a girl into a young woman. She was seventeen when, at a dance given by her aunt, the Duchess of Kent, she met Philip again. The few years of separation had changed them both. Elizabeth was taller and slimmer. Her hair, originally a dark gold, had deepened into brown. Her skin was a lovely, unblemished satin, with the exquisite coloring which makes her so much more beautiful in real life than she appears in her pictures. Philip, strikingly handsome as a boy, had become even more attractive as a man. His service at sea had hardened his tall, lean body, and with his blond hair, chiseled features, and quick, quizzical smile, he was someone any princess might lose her heart to. After that party, at which Philip and Elizabeth danced together almost un-interruptedly, the rumors began. Every visit Philip made to Buckingham Palace, or to Windsor Castle—and he made several—was reported in the newspapers. Someone remembered a remark the young Princess had made: “The man I marry will have to be tall and good looking.” Was she describing Philip, hinting that she had already made up her mind? But the marriage of a future queen can’t be decided in a month, or even a year. All the rumors were abruptly silenced when Philip returned to sea duty and Elizabeth began appearing In public with other young men. It was plain that the King and Queen had talked to Elizabeth, reminding her of what she already knew—that her life was not entirely her own. She belonged to the people of England and her first duty was to them. A serious objection to Philip as a suitor for Elizabeth’s hand was that his family—the Royal Family of Greece—was decidedly unpopular with many sections of the British public. So much so that any talk of a marriage between them could have had unfortunate political consequences. It hadn’t been so very many years since England was rocked by the scandal of King Edward’s abdication in favor of marriage to Mrs. Simpson, and the Royal Family was anxious to avoid anything which might look like a repetition of that affair. In addition, the King and Queen of England were like two loving parents anywhere. They didn’t want their daughter to rush into a marriage she might later regret. With particularly good reason in their case, too, because divorce for a member of the Royal Family of England is simply not possible. Whomever Elizabeth chose as her husband must remain her husband for her lifetime. With the sense of responsibility which had been drilled into her from childhood on, Elizabeth consented to follow this advice. But with the loyalty which is also one of her chief characteristics, she kept Philip’s picture on her dressing table, and through the months which remained of the war, she and Philip wrote to each other regularly. 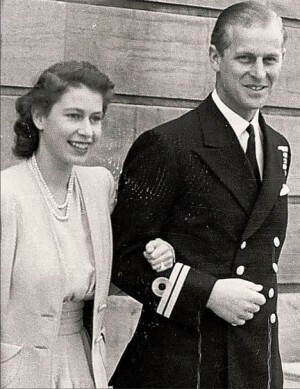 “BUT when you’re in love, letters are a AM poor substitute for the nearness your heart longs for, and during the summer of 1945 Elizabeth persuaded her parents to invite Philip to visit the family at Balmoral Castle in Scotland. There, in the midst of magnificent highland scenery, they danced and laughed and rode, finding relaxation from the war and the busy official life of London. For the first time, perhaps, the King and Queen began looking upon Philip seriously as a possible future husband for Elizabeth. In one way, though, that happy time at Balmoral Castle was a mistake. The English newspapers got wind of it and added it to all the rumors that had been circulating about Philip and Elizabeth before. Only a few weeks after Philip had returned from Balmoral Castle to his Navy barracks. he opened a newspaper at breakfast and saw his own engagement to the future Queen of England announced in blazing headlines. This premature, unauthorized announcement was a bitter blow to both young people. For under the circumstances, the only thing the Palace could do was to issue an immediate denial, flatly saying that no engagement existed or was planned. 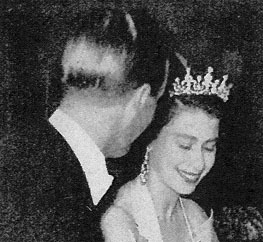 From then on the relationship between Philip and Elizabeth was constantly aired in the British press, and became a matter of public discussion. About the same time, just when interest in him was at its peak, Philip had a stroke of bad luck. He was a fast but usually expert driver of his little British-made open roadster. One evening, rounding a corner at high speed, he skidded and went into the ditch beside the road. He wasn’t hurt and the car wasn’t too badly damaged, but the story got into the papers and gave gossips something else to wag their tongues about. During the months after their engagement had been denied, both Philip and Elizabeth learned to practice the strictest self-discipline. They still saw each other, but only occasionally, and then only at large social affairs to which each came separately. Every news photographer in England was on the alert to catch a photograph of them together—but not one ever did. 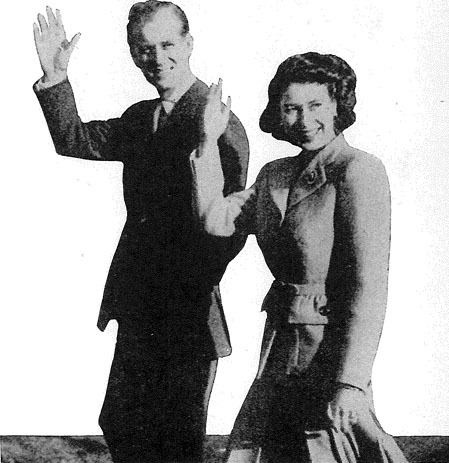 One thing the King and Queen and their advisers did insist upon before they would consent to announce the engagement. Elizabeth must go with her parents on a tour of South Africa. Not only was it her duty to appear with them in that far off but important corner of the Dominions, but one last separation from Philip was considered advisable. Only Philip and Elizabeth themselves know what passed through their minds during the months of separation while the Princess dutifully greeted South African dignitaries, and admired South African scenery, and Philip remained in England, waiting. Elizabeth must have remembered what she had read in her history books of Victoria and Albert. “I know,” Victoria wrote in her diary after her engagement, “that I am asking him to make a very great sacrifice.” And so it proved to be. Though he loved Victoria, Albert was a far from happy man. Did she, Elizabeth, have the right to expect Philip to make the same sacrifice? To sink his personality in hers, to stand forever in the background while she, the Princess –and later the Queen -was always in the spotlight. Could they, or any couple, be happy in such a situation? Very similar thoughts must have come to Philip. He was a man of action, an athlete. He was impatient with the stuffiness of Royal tradition and protocol. Now he was in love, and it seemed to him he could cope with any situation. But what about later on? How would he feel with the passing years knowing that his position in the world, his work, his every action must be considered in the light of his wife’s position as Queen? Would he measure up to it? Any man would have to ask himself that question fearfully. Philip did not answer it that way. Elizabeth missed Philip so terribly on that South African tour that when the ship docked on her return and she felt the soil of England under her feet, she did a little jig of happiness. One of the first visitors to Buckingham Palace after the Royal Family’s return was Philip, driving all night in his roadster from the port where he was stationed. Whatever doubts either Elizabeth or Philip had had during their separation vanished now in the delight of meeting again. And from then on, although other denials of their engagement were issued, quiet preparations to make Philip eligible went on. Very soon after the announcement of their engagement, the time came for Philip and Elizabeth to make their first public appearances together, first at a large garden party within the Palace grounds, and later on a balcony of the Palace where they could be seen by the public. Long before the time they were to appear on the balcony, crowds gathered outside. Standing inside the glass doors, Philip struggled with nervousness. Then the doors were thrown open. Elizabeth gave Philip a quick smile that seemed to say, “Darling, don’t worry. You’ll get used to this. I have.” Then together they stepped across the threshold, and at sight of them the crowd gave a roar that seemed to halt the young lovers in their stride for an instant. For a few minutes they stood there, the Princess as perfectly poised as ever, Philip obviously still struggling with his shyness. Both waved, and turned to greet the King and Queen and Princess Margaret Rose, who joined them on the balcony. The others stayed just long enough to acknowledge the cheers of the crowd, and then withdrew, leaving the young couple alone again. Philip must have known then that Elizabeth and he would begin their life together supported by the love and good wishes of the British people. No one hearing the cheers that went up could doubt that. In the dismal aftermath of a terrible war, without enough food and clothing to satisfy their needs, Britons still found time to recognize love and romance when they saw them. Their hearts were with their Princess, and the man of her choice. A few months later, in the same Westminster Abbey where Elizabeth will be crowned Queen of England in June, she and Philip were married. Even though ‘austerity’ was still the watchword in England, the wedding could not be either simple or quiet, much as both Elizabeth and Philip would have preferred that kind of an affair. As they must for the rest of their lives, the young couple did what was expected of them—and they were expected to have a Royal wedding that the whole of England could thrill to. Not even their honeymoon was private. Crowds followed them during their wedding trip through England and Scotland. They were seldom free from reporters, photographers, and even tourists who came hoping for a glimpse of them. 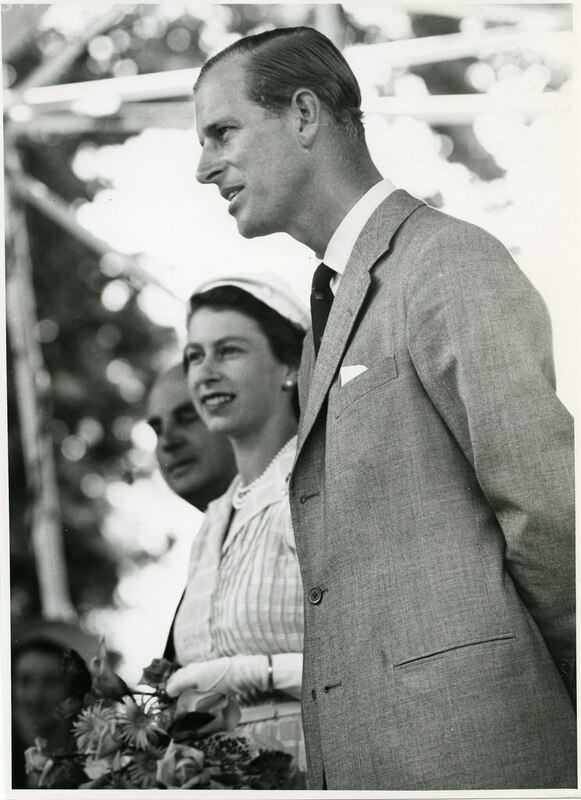 Now, with the end of the honeymoon, came the time when, like every young couple, Elizabeth and Philip began learning to translate their love into terms of day-to-day living. Though they could not know it, they were to have only a little more than four years before Elizabeth would be called on to shoulder the burdens of a reigning sovereign. Even before those four years were up, the demands on their time, energies, and patience were heavy.